Born in the Tuscan Region of Northern Italy….. It was the summer of 1962 in Lucca, a small village town in the Tuscan Region of Northern Italy where Giovanni and Graziella lived for all of their lives. As newlyweds, they decided to leave Lucca and make a new life for themselves in America and upon arrival, settled in Cicero, Illinois, a suburb of Chicago. It was on December 28th, 1962 that their son, Maurizio, was born. Raised in a traditional Italian household, Maurizio learned both English and Italian simultaneously. As a youth, Maurizio joined a touring youth choir and traveled to Italy where he sang before the Pope in Rome. At age 15 he got his first paying job singing in a bar in Stone Park, Illinois. In 1984 at age 22 he started a rock band called Broken Heart and was the lead singer for the group. While changing their names several times, “1313?, “The Dream Police” a tribute band to Cheap Trick and “The Big Band Rodeo”, they toured the Country working the college circuit. In 1992 Maurizio was discovered when he won the runner up prize on the popular TV show Star Search and began his professional career. It was then that he decided to change his singing style from Rock to Pop and his name to TONY OCEAN (from Frank Sinatra’s portrayal of Danny Ocean in the movie Ocean’s 11). His career took a change when he did a Dean Martin impersonation at one of his shows. The owner was so impressed that he paired him with two other artists who impersonated Frank and Sammy Davis, Jr. and a show called “The Pack Is Back” was born. They appeared to sellout crowds for eight months and earned the respect of critics and music lovers while performing at Piper’s Alley, a well known Chicago nightclub. 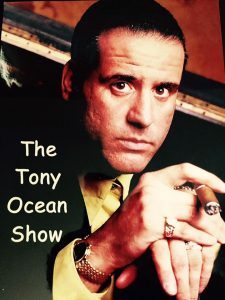 Tony Ocean’s upbeat style embodies a time from the past that will be popular as long as we still enjoy the music of Sinatra, Martin, Davis, Darin, Tony Bennett, Tom Jones and others whose romantic songs and lyrics have affected so many of our lives through the years. In December 2007 Tony released his first nationally distributed Cd titled “Pardon my Past” featuring a collection of new songs written by Bonnie Koloc and Jim Tullio. The CD has a selection of old standards with a preview of the new format Ocean has developed. In Summer 2009, Tony Ocean returned to the studio to record his project “Me and Mrs Jones”. The Cd’s main release was in March 2010 which followed the release of the music video which was filmed in Rosemont, Illinois. 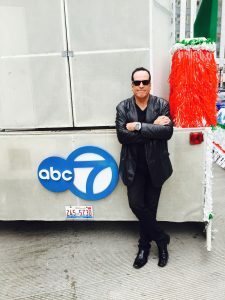 Since then, Tony has made numerous appearances on television and radio in the Chicago markets, and has been performing through-out the U.S. at hundreds of venues annually. He sings almost every weekend in addition to fronting his other music project, a highly sought out and acclaimed Cheap Trick tribute cover band, known as The Dream Police. The band puts Tony on the stage alongside life long friends Tommy (Bam Bam) Burke playing Drums, Bill Hall on Lead & Rhythm Guitar & Vocals and Mark Schiele on Bass Guitar & Vocals. In 1998 Tony was selected for the David Award for Top Performing Artist in entertainment by the Italo American National Union Foundation. The award is bestowed upon youthful people who exhibit the will to succeed, the vision to endure and the beauty within. As one of the hardest working performers in the industry with 297 performances in 1999, Tony is expanding his career into national exposure and is presently under consideration by several producers and directors for parts in television and films.